This mineral looks so delicious, I could gobble it up like candy! It’s calleda Rhodochrosite Stalagmite, meaning it’s a Rhodochrosite formed as a stalagmite. Rhodochrosite are maybe the most famous minerals because of their red and hot pink allure. The mineral belongs to the calcite group of minerals, a group of related carbonates that are isomorphous with one another. Like all calcites, it crystallizes in the trigonal system, have perfect rhombohedral cleavage, and exhibit strong double refraction. 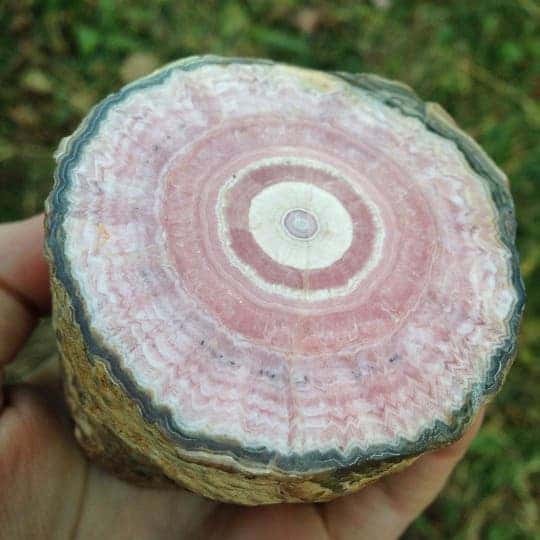 This particular Rhodochrosite is considered an oddity. It’s only found in Argentina, particularly in the ancient Inca Silver Mines where Rhodochrosite form as stalagmites and stalactites. According to minerals.net, these “formed from precipitating water dripping from the manganese-rich rock inside the ancient mine tunnels, and kept on growing over the centuries into large stalagmites. These stalagmites are beautifully banded with concentric growth layers and are often sliced and polished into slabs for collectors”.